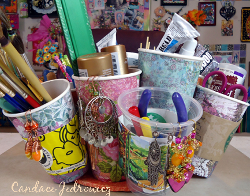 Gather up your supplies and create an Upcycled Craft Tool Caddy from Candace Jedrowicz using paper coffee cups. Organization crafts are both fun and practical. Best of all, you don't have to spend a ton on supplies when you use eco-friendly materials like coffee cups. If you’re like me you’ll want to wrap the paper coffee cups in pretty paper, but it’s not important to the construction.Put the sleeve on the cup. If you are just starting to build your tool caddy, refer to the original project by the link above. That being said, it’s not rocket science. 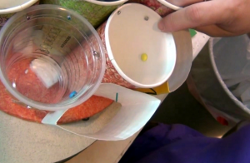 It’s the same basic idea, but you’ll be joining the cups without sleeves. Place the cup with sleeve on, where you want to attach it. 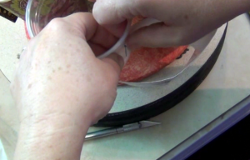 Make a pencil mark on the sleeves at the point of contact on both sides. Apply Tacky Dots to the inside of the pencil marks on the sleeves at the top and bottom. Leave the middle clear so the craft knife goes through smoothly. 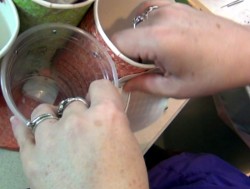 Leaving the cup in the sleeve, push into place.Remove the cup and press firmly to secure it. Using a craft knife, cut a slit in both the cup next to the sleeve and the sleeve.Wiggle the blade back and forth to open the slit slightly. This will help you get the brad through easily. 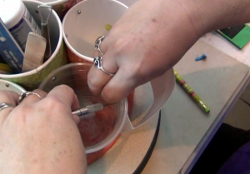 Push the brad through the cup and sleeve and open the prongs. Repeat on the other side of the sleeve, going through both sleeve and the cup next to it. Repeat for each sleeve. 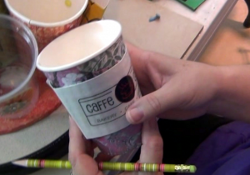 For a comprehensive video tutorial of this project, check out How to Make a Coffee Cup Tool Caddy. I love this upcycled caddy. It's a great way to recycle some of hose plastic party cups and coffee cups you've been hoarding. It looks like the office supplies desk organizer I have but this one is handmade. I clicked on the original project but the link just brought me back to this upcycled project so I really don't know how to finish it.